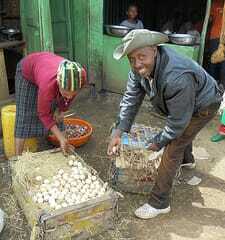 A profile of a couple who market eggs collected in local villages in a town in Ethiopia. They are being helped to overcome their main challenges - a lack of working capital and breakages during transportation - by a local NGO. Etaferahu Bogale and Zewdu Berasso are a married couple who live in Daye town of Arbegona district in Sidama zone in southern Ethiopia. The couple own a small shop in the heart of the town where among other items, eggs are sold. Etaferahu and Zewdu pack eggs for Hawassa market. Chicken eggs are an important source of protein and income for smallholders in many parts of Ethiopia. Sidama zone’s chicken population is about 1.3 million (16 per cent of the region) of which about 16 per cent are located in the intervention districts (Arbegona, Bona zuria and Bensa) of the Livestock and Irrigation Value Chains for Ethiopian Smallholders (LIVES) Project. These three districts are situated in mid to highland agro-ecologies. 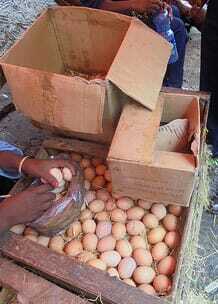 Etaferahu and Zewdu buy eggs from Arbegona district and sell them in Hawassa town. On average, they collect between 13,000 and 15,000 eggs per week to take to the market in Hawassa. About five other egg traders with similar capacities are also operating in the district. There are three market days in and around Daye town of Arbegona but egg collection is not limited to these days. Etaferahu and Zewdu get their eggs from village collectors who collect eggs from different village markets and get a commission of 0.10 Birr (ETB) per egg. Most village collectors receive working capital to purchase an agreed number of eggs. Sometimes, young boys or girls collect eggs and occasionally chicken owners deliver eggs to the couple when they need cash. In Arbegona, traders inspect egg quality subjectively. The inspection includes manually weighing an equal number of eggs (i.e. if eggs of equal size in one hand are heavier, the conclusion is that they are spoiled), observing physical appearance (the ones that attract flies are spoiled) and looking at the egg against the sun and if the inside seems dark or opaque, the egg is probably spoiled but if it is bright and transparent, it is of good quality. Etaferahu and Zewdu use the same method to inspect their eggs. Those that pass the assessment are kept for the Hawassa market while those that do not are returned. Other egg traders in Hawassa – wholesalers/retailers – use the same method of quality assessment. The price of eggs fluctuates following the fasting season of the Ethiopian Orthodox Church. For example, during the recent fast of Assumption (Dormition) which occurs in the month of August, the price of an egg in Arbegona market dropped from ETB2.25 to 1.90. Traders in Arbegona usually purchase eggs anywhere from ETB2.15 to 2.40 each, depending on the quality, volume and regular supply; the higher margin occurs during major holidays such as the Ethiopian New Year. According to Etaferahu, Zewdu and other traders in Hawassa, there is no difference in price between eggs from indigenous and exotic birds during collection, however the selling price of the latter is slightly lower than the former at the Hawassa egg market. Traders normally market mixtures of the different types of eggs together and the larger sized eggs are sold at a higher price in the Hawassa egg market. Etaferahu and Zewdu have noticed that eggs from indigenous chicken from Arbegona are preferred by the Hawassa market because of their better size and quality. Traders in Hawassa market also indicated that the eggs from Arbegona are larger and have a longer shelf life. After collection, Etaferahu and Zewdu assemble the eggs in wooden boxes, which were originally constructed to transport tomatoes. They place different packing materials (such as teff or wheat straw) inside the boxes to protect the eggs. Etaferahu said that some of the eggs which break during quality assessment and packing prior to transportation are used to make omelettes for customers in their shop. Each week, anywhere from 13 to 15 boxes, each with about 1,000 eggs, are packed and transported to Hawassa. The packed boxes are transported by trucks along with other commodities such as vegetables. Transport charges are ETB25 per box and approximately 20 eggs per box (one per cent) get damaged during transport. Retailers in Hawassa use small cardboard or bamboo boxes and plastic bags with similar packing materials when they sell the eggs. They also use sawdust from furniture shops and sawmills as packing material. Etaferahu and Zewdu are eager to improve and expand their egg marketing business beyond the Hawassa market but face many challenges. These include lack of working capital, especially during peak demand periods, poor egg transport containers and lack of a proper egg transport system. Moreover, since the couple does not have direct links with users such as hotels, pastry shops and other institutional buyers, they sell eggs at a lower price directly to wholesalers or retailers at Hawassa market. To help address their working capital limitations, Zewdu attended a training course on basic business skills organised by LIVES. The training included topics such as business plan preparation as well as marketing. Staff from Omo Micro Finance and technical staff from the Zonal Office of Agricultural also took part in the workshop. This helped Zewdu create a network to develop a business plan which will then be considered by a lending institution. To reduce losses due to packing/transportation, LIVES is assisting in identifying sources for improved egg packaging materials. LIVES will also provide further support on possible markets and egg bulking arrangements to reduce transport cost per unit of egg in LIVES intervention districts in Sidama. This article was written by Yoseph Mekasha and Dirk Hoekstra with contributions by Tesfaye Shewage, Birhanu Biazin and Dereje Legesse and was first published by Livestock and Irrigation Value Chains for Ethiopian Smallholders (LIVES) from the International Livestock Research Institute (ILRI) in Nairobi, Kenya.